Stand out... Differentiate yourself from the competition by giving a TRULY UNIQUE business card that is sure to stand out among a sea of others. Customizable... Available in your choice of: paper, color, size, printing. Embossing, debossing and rounded corners also available. Selection... 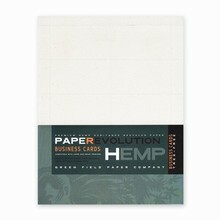 Choose from our Grow-a-Note®, 70# or 110# Hemp Heritage®, or Handmade Specialty Paper including 100% Junk Mail® and Denim paper.